Cynthia Mari Orozco is Student Services Librarian at California State University-Long Beach in Long Beach, California. 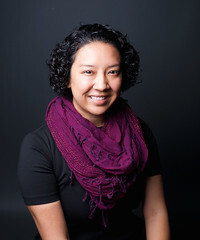 Cynthia has been an ACRL member since 2010, is a 2015 ALA Emerging Leader, and your ACRL member of the week for March 2, 2015. 1. Describe yourself in three words: Passionate, creative collaborator. 2. What are you currently reading (or listening to on your mobile device)? Americanah by Chimamanda Ngozi Adichie; Give it to Me by Ana Castillo; When Google Met Wikileaks by Julian Assange; and killing rage: Ending Racism, bell hooks. 3. Describe ACRL in three words: Commitment. Community. Collaboration. 4. What do you value about ACRL? ACRL provides a comprehensive way for me to stay in tune with what’s happening in college and research libraries, from its publications to professional development opportunities to the amazing network of colleagues. 5. What do you as an academic librarian contribute to your campus? As Student Services Librarian, I’m responsible for liaising with groups on campus that fall outside of the scope of specific academic departments, including Educational Opportunity Program (low-income, first-generation college students), pre-baccalaureate students, international students, transfer students, and new graduate students. 6. In your own words: I couldn’t be happier with the career path I’ve chosen. I had the good fortune of working with a great area studies librarian while I was pursuing my Masters in Latin American Studies, and her subject expertise, commitment to my success, and patience in explaining the foreign terrain of research to me was incredibly inspiring. Reflecting on how much I didn’t understand about information and research as an undergraduate, I decided that I wanted to be an academic librarian to ensure that students didn’t make the same mistakes I did and understand all of the library resources and services available to them, as well as mitigate library anxiety. The library can be a really scary place for students!